The 3 and 6 kreuzer stamps were printed on paper with an embedded silk thread to prevent forgeries. 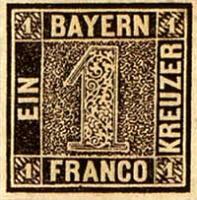 The 1 kreuzer stamp covered postage for local mail and was therefore printed first. All three stamps were issued at the same time anyway. The first printing was made in deep black, but since that made the cancel, also in black, difficult to see the following printings were done in gray-black. Due to the fact that the printing plates weren't hardened, only about 2,000 sheets of 180 (= 360,000) stamps were printed in the first printing. The second printing was done using a retouched and hardened plate, printing the remaining about 472,500 stamps in sheets of 90, or 5,250 sheets. The first printing was done at a rate of about 300 sheets of 180 stamps, or 54,000 stamps, per day. The gum used was fabricated from a simple recipe: 12 liters (3.2 gallons) of water, 6 pounds of 'Gummi Arabicum' (gum arabic or arabic gum) and one pound of sugar. After 24 hours it was applied luke warm with a brush. For this operation the sheet was stretched on a frame. The one kreuzer had a short usage period. It was replaced by a pink colored stamp on October 1, 1851. The 1 kreuzer stamp is famous enough to have earned a nick name: 'Schwarze Einser'. There are plenty of forgeries around, perhaps as many as 20 to 30 different ones! You can visit Philatelistenclub Bavaria if you want more information. The site is in German. 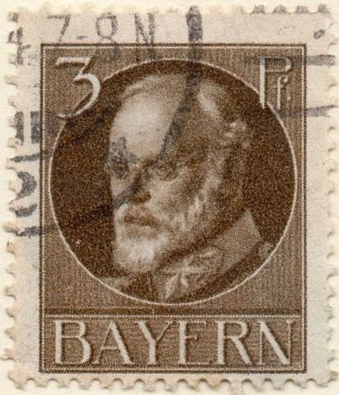 Bavaria produced the first photogravure stamps in 1914.